Posted byAtulHost	 31st May, 2017 23rd Dec, 2017 Leave a comment on WordPress vs Static HTML: What is the Best for Your Business Website? Launching a business on the web requires extra efforts than just defining the business objectives. The reason behind it is the hardship businesses face in selecting an ideal hosting platform for their business. The two CMS that are competing in the race of the best hosting platform are WordPress and HTML. Both WordPress and HTML come with their own set of advantages and disadvantages, but the usage of each may depend as per the needs of businesses. The post shares a quick comparison between WordPress and HTML to help you choose the right platform for your business. Since its inception in the year 2003, WordPress has taken the web like a storm. Written in PHP, WordPress is an open source software. It was earlier meant to be merely a blogging platform, however later expanded itself by serving millions of websites. Till the present day, WordPress has emerged to be the most powerful and popular CMS conquering millions of online businesses. The present day stats reveal 75 million websites hosted on WordPress. The reasons that make WordPress so famous are flexibility, administrative control, easy-to-use admin and many others. WordPress is one such platform that can be operated even by a non-techie. The benefits of WordPress which include simplicity, ease-in-use and greater flexibility outranks it as the powerful CMS. Designed on a strong framework, WordPress allows businesses to use pre-installed features that can be extended with the use of plugins. Additionally, businesses can also add more functionality to their website as the CMS is highly customizable with little or no limitations. WordPress dominates the market because of its easy-to-use dashboard. It does not require businesses to take the help of WordPress developer. All you need is a simple login using which multiple pages can be created. The new fixes and patchwork with the CMS are also introduced with the release of new update. Updating the WordPress site is also a minute job. A large number of free templates and plugins are available with WordPress that can be installed with just a single click. WordPress is completely a SEO-friendly platform. It is coded to give a boost to your search engine rankings. Built on a PHP framework, WordPress can create dynamic web pages for the site. These dynamic websites are good for businesses as there is no need to create varied versions of pages. The PHP server on which WordPress is developed dynamically creates and loads different web pages. With WordPress even the smallest information can be updated and managed from the dashboard. WordPress offers the complete freedom to enjoy intuitive interface with full control. There are a few issues that developers find with WordPress. Automatic updates are not possible with WordPress. With every new update, developers will have to navigate to the dashboard and perform it manually. For doing the same, managed WordPress hosting provider need to be contacted. WPEngine and Bluehost are amongst the best hosting providers. People who are new to WordPress might find a bit difficulty in learning. The support section of WordPress is helpful and there are some other easy tutorials available online using which you can learn WordPress. Websites that are designed with HTML markup language static HTML websites. The web pages use HTML markup and other scripting languages to create a website. HTML is preferred with small websites that do not require much updates. Hiring a web developer is important to manage the code for HTML-based website. HTML is more cost-effective than WordPress. When it comes to flexibility, WordPress wins the race owing to its ease of use. It allows to manage and edit content in the simplest and quickest ways. The addition of dynamic content is possible without involving a technical coder. With HTML, the knowledge of coding is must. If you are not technical, there would be an emergent need to hire HTML coder. So, HTML is good if there is no requirement of update on the website, else, WordPress is a wise investment for getting appealing websites on the web. Static HTML websites are economical as compared to the WordPress. WordPress sites, on the other hand, need MySQL database and PHP support that requires maintenance cost. When it comes to security, HTML websites are a better choice because they are less vulnerable whereas WordPress sites are easily cracked down by hackers. WordPress websites come with an engaging forum and support community where you can get answers to all queries. The community is highly professional to help out with anything. 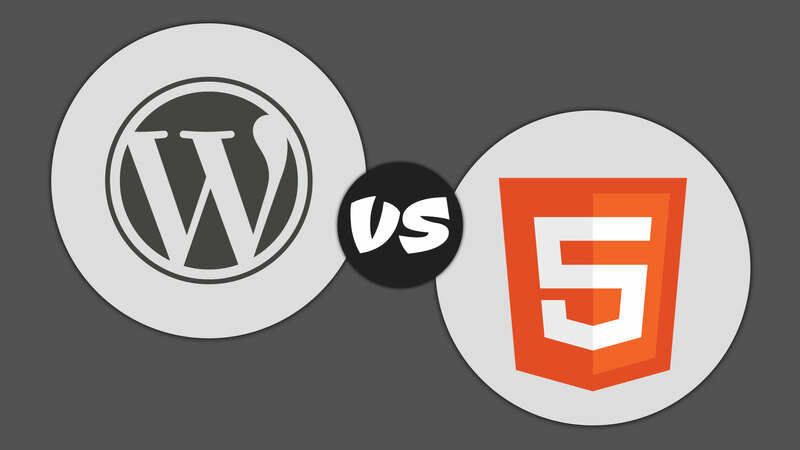 The comparison between WordPress and HTML will easily help you take a wise decision. Considering the requirements of enterprises, it is always good to make a shift to WordPress. Opting WordPress for hosting will save both time and money. HTML might work at times, but WordPress could be an ideal solution in the long run. This article is written by Bryan Lazaris. He is a HTML professional employed at HireWebDeveloper. He works towards providing custom HTML development services to clients globally. Owing to a huge skill set and proficiency in the related domain, he has achieved successful results till now. In addition to this, he also likes sharing knowledge on HTML web development. This blog is one of his unique and well-written composition aimed at delivering useful knowledge to readers.